Re: Did Oswald Go To Mexico City? Yes, I did ask that. 1) Is there anything else? 2) Do you believe KGB-boys Nechiporenko, Yatskov, Kostikov, and Leonov, because, you know, The Cold War was like over man by 1992 (or whenever), and the KGB had become a truth-telling humanitarian organization by that time? WHO benefited from the demise of John Kennedy? Regarding Studebaker: Fine, but does that necessarilly mean that some evil, evil, evil American (or someone contracted by that evil, evil, evil American) stashed or planted that rifle there? does that necessarilly mean that some evil, evil, evil American stashed or planted that rifle there? Think about it.... The fake photos of the rifle in situ and the story that was IMMEDIATELY dumped on us trusting ignoramus's said that Lee had dashed by the top of the stairs and hastily dumped his rifle behind some boxes of books as he fled after shooting President Kennedy. "Do you believe KGB-boys Nechiporenko, Yatskov, Kostikov, and (Duran's/Azcue's) 'short, blond, thin, blue-eyed, 35-ish, very thin-faced' (KGB colonel) Nikolai Leonov, because, you know, The Cold War was like over man by 1993 (when Passport to Assassination was published), and the KGB had become a freakin' truth-telling humanitarian organization by that time?" PS Cakebread asked: "Who benefited by the death of JFK?" My answer: Well, in the longrun, KGBMafia-boy Vladimir Putin did, seein' as how Kennedy's murder gave rise to oodles and gobbs of anti-U.S. government Tinfoil Hat Conspiracy Theories, which in turn paved the way for Cozy Bear and Fancy Bear and Guccifer 2.0 and Putin's lackey-agent Julian Assange, and how they successfully trolled American voters who had already been properly "conditioned" by said CTs to forego fact-checking altogether, and just go with whatever clickbait kinda "resonated" with them, be they on the Left, or on the Right. But in the shorter run, Khruschev certainly stood to benefit from JFK's sudden demise, especially since he knew CIA would figure out that he and/or Castro had done the foul deed. I've alread posted about that on another thread. Did you miss that, too? No. He said he didn't just like he said he was a patsy. It doesn't matter what thin-face man says. There is too much evidence elsewhere to show that he was just being set up. They had him where they wanted him. Read George Michael Evica's books, Tom - A Certain Arrogance and We Are All Mortal. They're available as free downloads. It'd be next to impossible to take all of this planning and setting up of LHO - with Paine, Ruby and others - to then some how project it all on the Russians. There's no way the Russians could have done this much behind the scenes planning as it happened. And like you seemed to project in another thread, Paine was NOT KGB. That was a real shocker for me to read you say that because except for the Russian thing, you seem pretty sensible otherwise. Here (below) is the draft copy of the letter that Oswald sent the Soviet Embassy in Washington where he discusses going to Mexico City and visiting the Cuban consulate and Soviet Embassy. The handwriting was identified as belonging to Oswald. He would then type a letter - using Ruth Paine's typewriter - and mail it to the Soviet Embassy. Both Marina Oswald and Ruth Paine testified that they saw him type the letter. His signature on that letter was identified as being Oswalds. The letter was shown by the FBI to have been typed on Ruth's typewriter. Additionally: People who were on a bus going to MC said they saw and talked to Oswald. People at the hotel - a cleaning lady and waiter - said they saw him. Cubans at the consulate - Duran and Mirabal - say it was Oswald. The Soviet officials - KGB agents - say the man was Oswald and that the man in the photos did NOT identify himself as Oswald. There's a visa issued to Oswald from the Mexican consulate in New Orleans with his handwriting/signature on it. On and on and on it goes. It's not a question of accepting the KGB accounts. We look at their accounts and corroborating evidence. That evidence for me is conclusive. Oswald saying - through the accounts given by Fritz and Hosty - that he didn't go to Mexico City is sufficient proof for you that he didn't go? That's all it takes? Question please: You believe "they" set him up as going to Mexico City and then you believe "they" said he told them he didn't go to Mexico City? Why would they do this? If they "set" him up why didn't they say he admitted to going there? He was dead; they could say he said anything. You do realize that what you believe makes no sense at all? You have them framing him for going to MC and then saying he didn't go. Why would they do this? 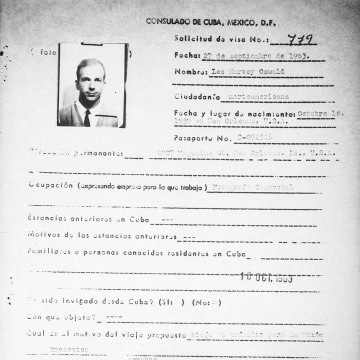 Here is one of the copies of the transit visa that Oswald applied for when he visited the Cuban consulate in Mexico City. This was supplied by the Cuban government. The signature was identified as belonging to Oswald. The Cuban official - Sylvia Turan Duran - who typed out the forms has said for more than 55 years that the man she met was Lee Harvey Oswald. Who's to say that Ruth or Marina or someone else didn't type that letter and write that draft? Fwiw, according to KGB defector Vasily Mitrokhin, the "Dear Mr. Hunt" letter was forged by the KGB to implicate the Military Industrial Intelligenge Complex in the assassination of JFK.